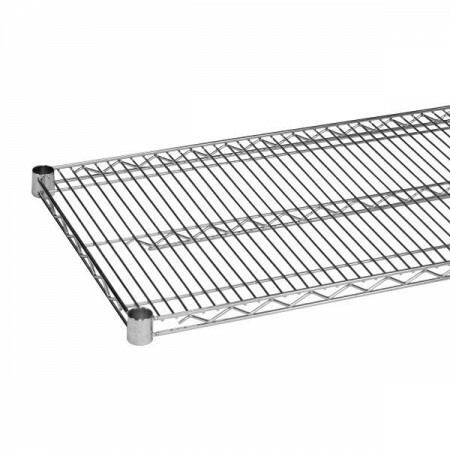 $34.99 Royal ROY S 1860 Z Polycoated Zinc Wire Shelf 18" x 60"
$63.99 Advance Tabco EG-1860 Green Epoxy Coated Wire Shelf 18" x 60"
$30.44 Winco VC-1860 Chrome Plated Wire Shelf 18" x 60"
$31.31 Winco VEX-1860 Epoxy Coated Wire Shelf 18" x 60"
An excellent addition to any hotel, restaurant, or food service facility, the Thunder Group CMSV1860 Chrome Wire Shelving 18" x 60" provides your kitchen with additional storage space and is perfect for keeping necessary supplies easily accessible to your staff. Featuring a heavy duty chrome-plated metal construction, this stylish wire shelf is rust resistant and is crafted to keep up with the high demands of any commercial kitchen. For added convenience, this NSF approved piece allows for easy setup and includes plastic clips.